Maratos effect: The SOC step. The material of this section is based on the following references: [NW99,Fle87,PT93]. Solve the QP subproblem described on equation 8.53 to determine and let be the vector of the Lagrange multiplier of the linear constraints obtained from the QP. Increment . Stop if . Otherwise, go to step 2. We will now give a detailed discussion of each step. The QP subproblem has been described in the previous section. Test the Wolf condition equation 9.18: ? True: Set and go to step 3. False: Set and return to the beginning of step 2. We have successfully computed the length of the step. The optimal solution is . The situation is illustrated in figure 9.5. The SQP method moves ( ) from to . In this example, a step along the constraint will always be rejected ( ) by merit function. If no measure are taken, the Maratos effect can dramatically slow down SQP methods. 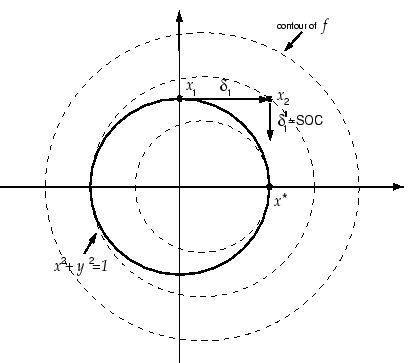 To avoid the Maratos effect, we can use a second-order correction step (SOC) in which we add to a step which is computed at and which provides sufficient decrease in the constraints. Another solution is to allow the merit function to increase on certain iterations (watchdog, non-monotone strategy). where is the jacobian matrix of the active constraints at . is an approximation of the hessian matrix of the Lagrangian of the optimization problem. The formula 9.35 is simply the standard BFGS update formula, with replaced by . It guarantees that is positive definite. where is a residual and is a related reference value. The length of the step is very small. The current point is inside the feasible space, all the values of are positive or null, The step's length is small. If termination test is satisfied then stop. Choose such that is a descent direction for at , using equation 9.20. True: Set and go to step 7. False: Set and go back to the beginning of step 6.